When administrators click the Security log of Event Viewer, it shows the following error message. "NT Service\Eventlog" account is removed on permissions of "HKEY_LOCAL_MACHINE\System\CurrentControlSet\services\eventlog\Security". By default, "NT Service\Eventlog" is granted "Allow - Read" permission on Windows Server 2008 R2 and later operating systems. 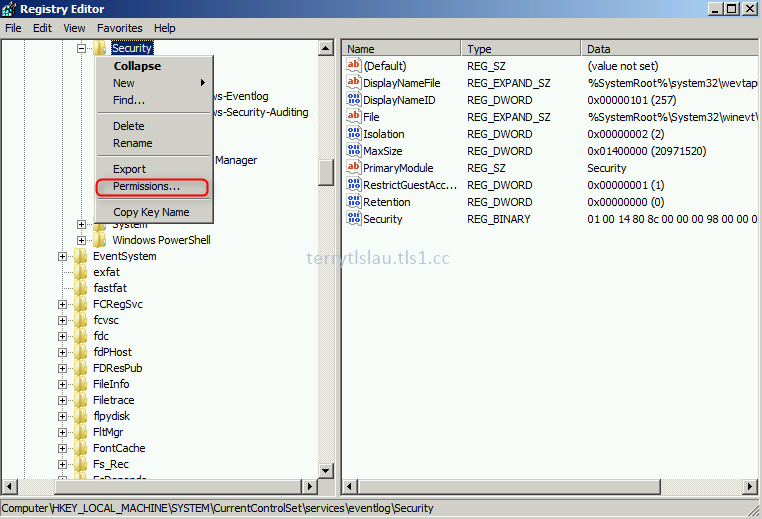 This account is removed because administrators might follow the Windows Security Hardening Guide before Windows Server 2008 R2 to configure the permissions of Security event logs. To solve this issue, administrators can do the following steps. 4. Right-click "Security", select "Permissions". 5. On "Permissions for Security" window, click "Add". 6. On "Select Users, Computers, Service Accounts, or Groups" window, click "Locations". 7. On "Locations window, select "<Computer Name>". 9. 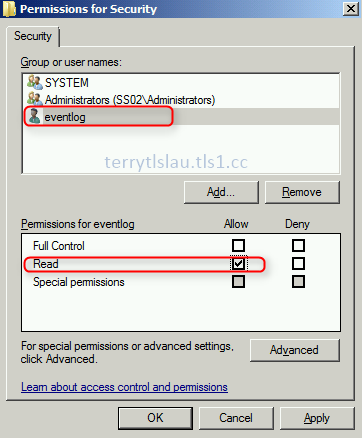 On "Select Users, Computers, Service Accounts, or Groups" window, enter "NT service\eventlog". 11. Grant "Allow - Read" to "eventlog" account.